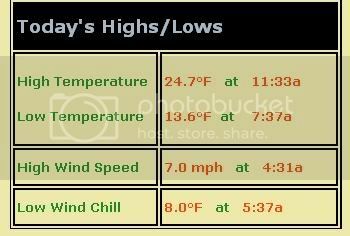 So, below are some images that I have found at different weather sites that I look at showing the cold temps here in the Albuquerque metro area. It is way too cold here. These are like the temps that we had in Breckenridge, CO, when I was up there for Thanksgiving with the family. I mean, come on, I live in the desert for a reason. Even Phoenix is cold (for them) they got down into the 30's last night. What really gets me is, I would not mind it being this cold if there was snow to go with it. But, no snow. Everyone else is getting it, so why cant we. I want snow! This image is from the NOAA / National Weather Service's two day history from the Albuquerque International Sunport. The Sunport is located in the southeast part of town, and borders with Kirtland Air Force Base. This image is from the NOAA / National Weather Service's two day history from the Double Eagle II Airport. Double Eagle is on the far westside of the city.